E is for Explore! : Crime, Scene, Inference, Trash! Set up a crime scene for a fun inference activity. Encourage kids to use their inference skills to investigate misplaced and random objects in the classroom! Mess up the room slightly while kids leave for computer class, a library visit, music, etc. Make sure that the changes are noticeable to spark curiosity in the students. Then, put some pretend caution tape across the door entrance (make out of paper). When the kids return back to class tell them that they are going to transform into mini detectives! Pass out badges and tell them not to touch or move anything! Have their journals out and ready to pass out. Next, as a class, go around the room and look for things that are out of place. Tell the kids to point out things that don't seem right. Then, write the out of place items in their journal. After they record the items, encourage students to make inferences about what they found. Knock over the trash can - Someone was in a hurry to escape! Leave 2 empty cans of soda and a bag of chips - There were two hungry people who like junk food. Put out a pair of headphones - One of them likes music. Sit out a basketball - They like to play sports, especially basketball. Maybe they were going to play a game. Lay out an opened book out - They read a story. They like to read. Banana peel - Someone likes fruit. They shared a banana. Maybe one of the intruders slipped on the banana when they tried to escape. Why were they in a hurry to leave? - They were nervous to stay because they aren't in our class. Clues from the Trash: Who's in the family? 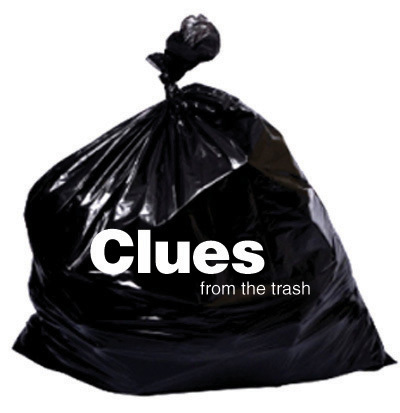 Fill a clean empty trash bag with "clean garbage" and encourage kids to use their inference skills to make guesses about "the family." Get creative! You can put some crazy things in the bag to get kids to think out of the box! As a OG (Orton-Gillingham) and Sp. Ed. Assistant, this idea is awesome for keeping the kids interested. I'm going to be running a day camp for kids w/ LD/Sp. Needs and plan to use this.